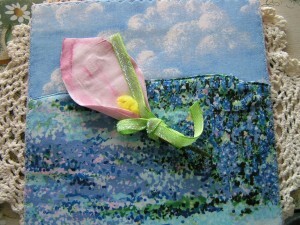 At Trading Fabric Postcards we do some other things besides our 4 x 6 cards. 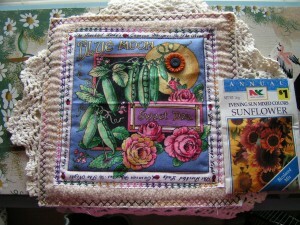 We have miniature quilt swaps and we also have what is called a FatBook Swap. The only way to describe them is think of you making a page to go in a book. 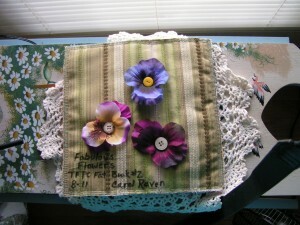 We decided to have a floral theme for the second round of FB swaps. 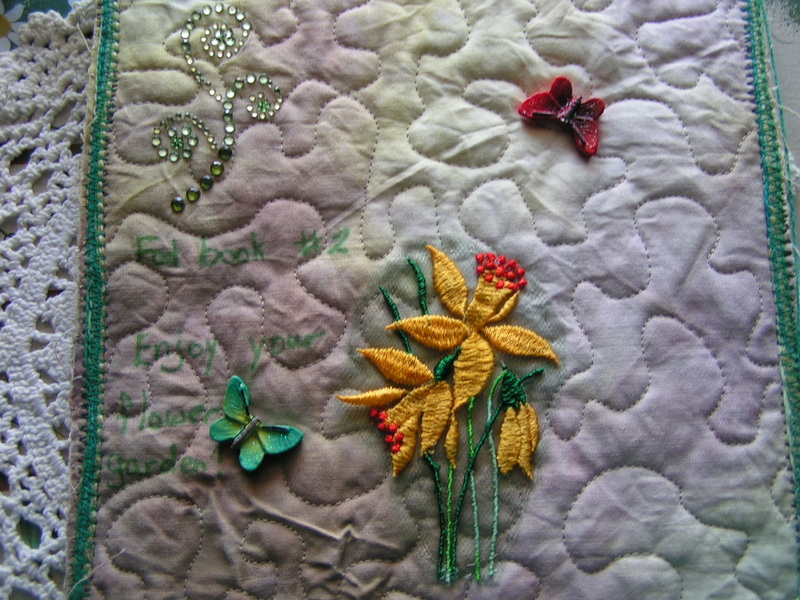 Now when I receive all my pages from the members I am going to put 3 grommets on the left side of the page, then make a front cover and a back cover. I then will find some type of ring that is large enough to hold all the pages. I may even use a notebook binder and cover it and just insert the pages in the binder. 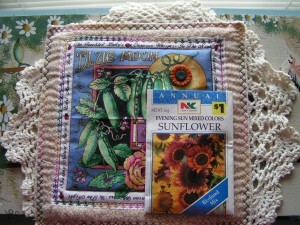 I have not decided yet how to put this together but I sure will post the pictures when it is finished. Here are some of the pages I have received on the 2nd swap. 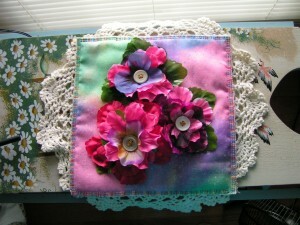 This is the front of the page by Jerri. 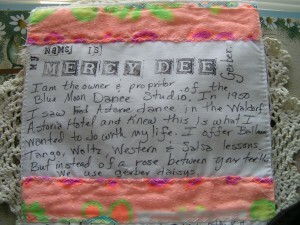 The ladies name here is Mercy Dee Gerber. 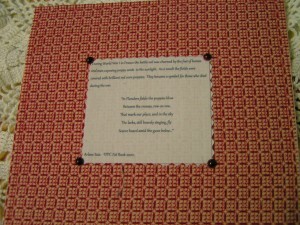 This is the back of the Fatbook page that Jerri did. Here is what is written. 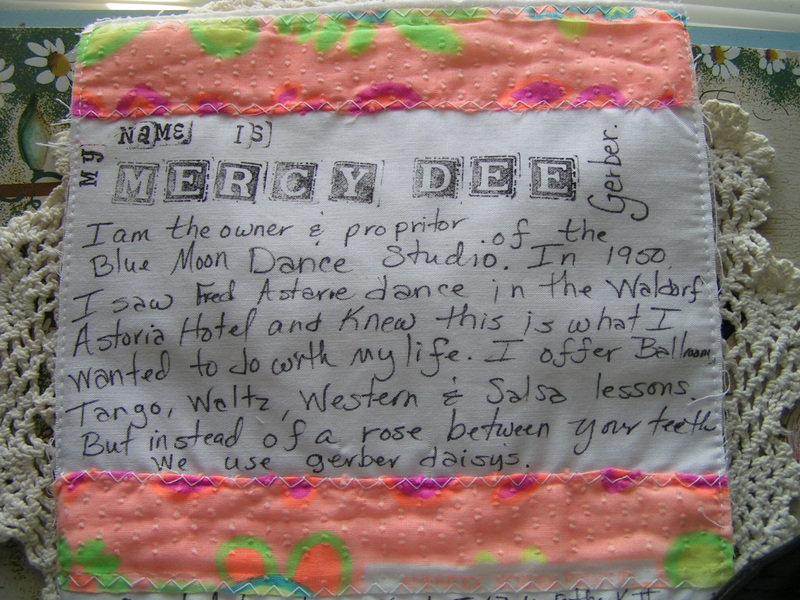 My name is Mercy Dee Gerber. I am the owner and proprietor of the Blue Moon Dance Studio. In 1950 I saw Fred Astaire dance in the Waldorf Astoria Hotel and I knew this is what I wanted to do with my life. I offer Ballroom, Tango, Waltz, Western & Salsa lessons. But instead of a rose between your teeth we use Gerber daisies. Shirley loves tulips and so do we. 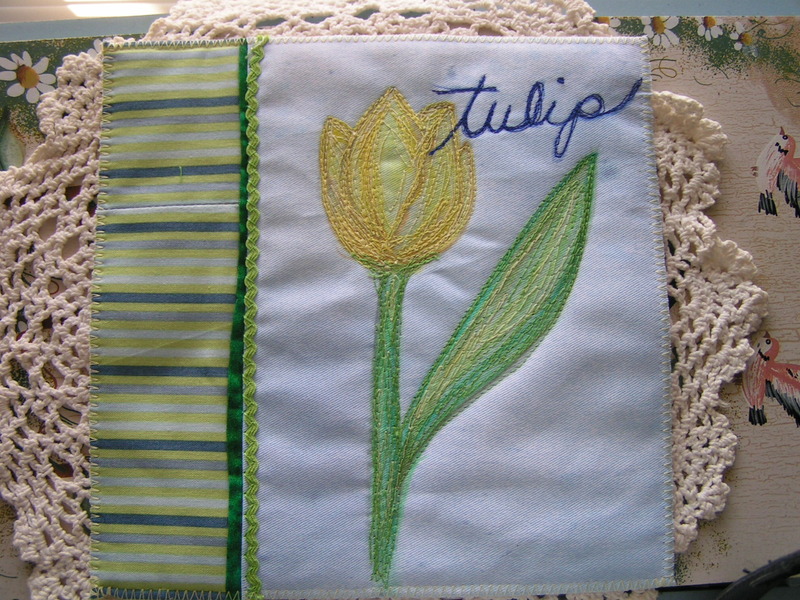 This is the front of her tulip page. 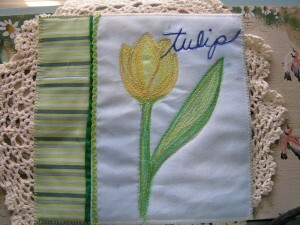 I love the way she used thread and her machine and made the tulip. 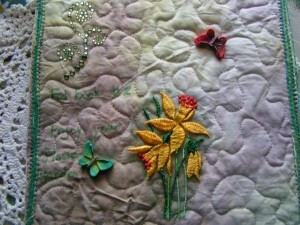 The striped fabric to the left adds to the card. 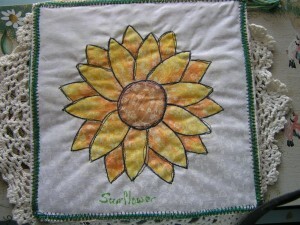 When I first got this page from Joyce, I wondered how she got such a nice sunflower applique on the page. 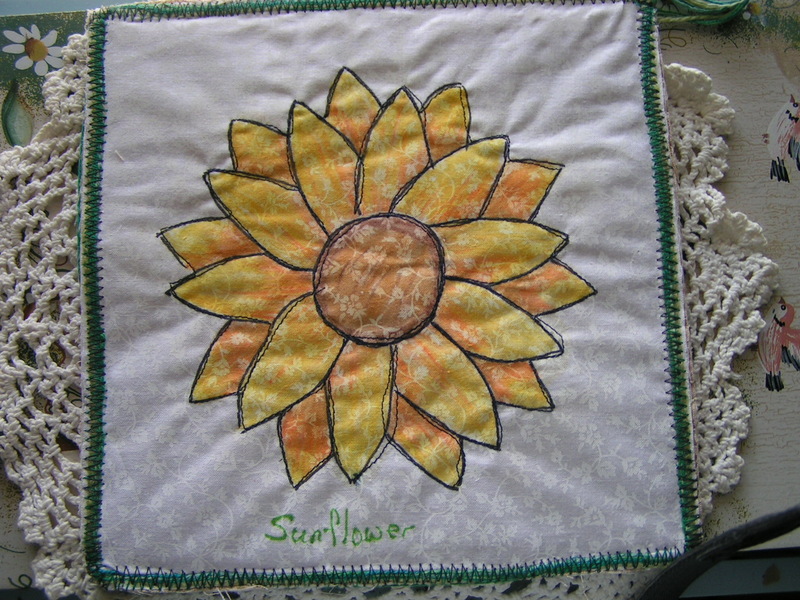 THEN later on after studying the Fatbook page I realized she drew the sunflower, the outlined it with thread and used some type of paint on the flower. It is stunning. Now for the back. I can’t decide which I like the best.. The front or back. But both are great! This is the front of Arlene’s card. 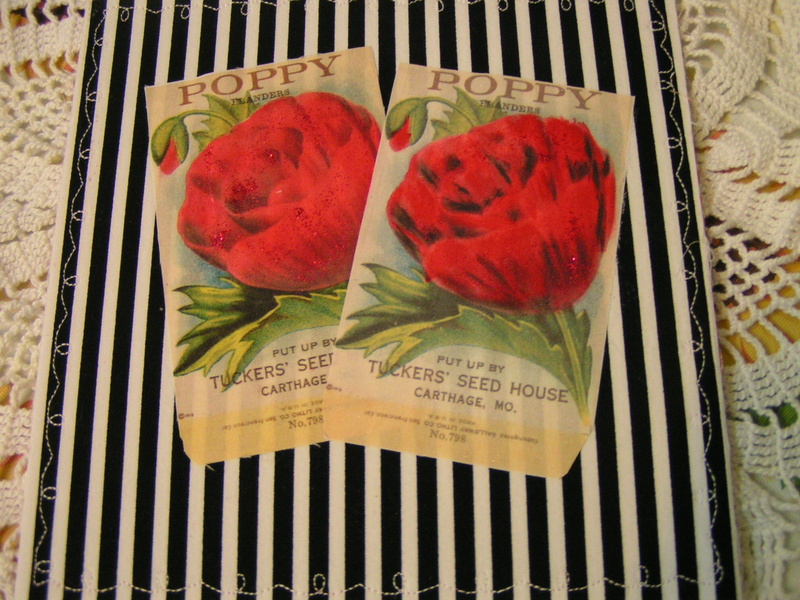 I never would have thought to use the black striped fabric and the red poppies are so glittery and nice. Now here is the back. 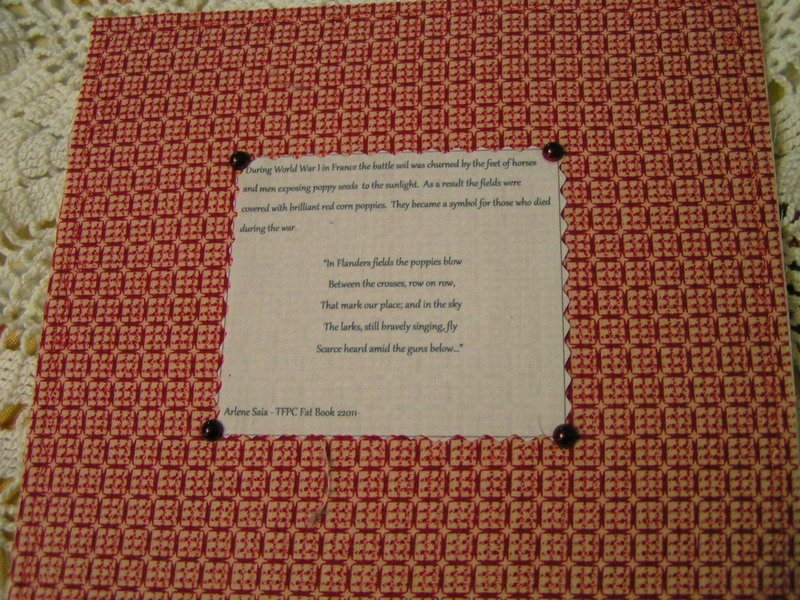 These is a story on the back and it says… During World War I in France the battle soil was churned by the feet of horses and men exposing poppy seeds to the sunlight. 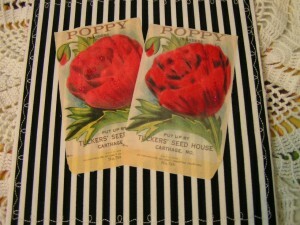 As a result the fields were covered with brillant red corn poppies. They because a symbol for those who died during the war. Now think of it.. All the times we bought those poppies from the Veterans we never knew the symbol behind it. Learn something every day from the ladies in the TFPC Group. Carol outdid herself on this card. She sent all my favorite colors all bunched up together. I love it and the background fabric goes with the flowers so well. She even fixed up the back really well.. Here is the back. 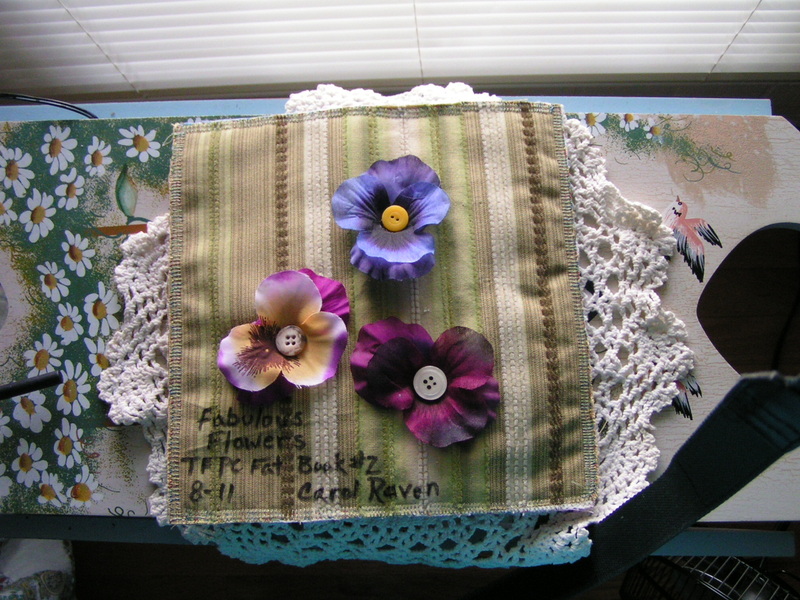 It looks like on the front and back she took apart silk flowers and stacked them and used a button for the center. 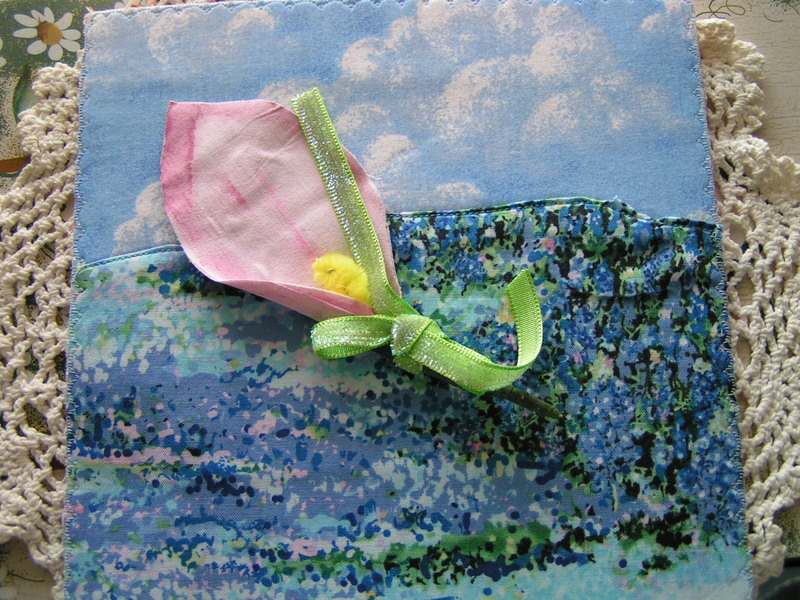 The front of Marlene’s card is a Calla Lily. I love those flowers. Makes me think of Princess Diana. She loved those. 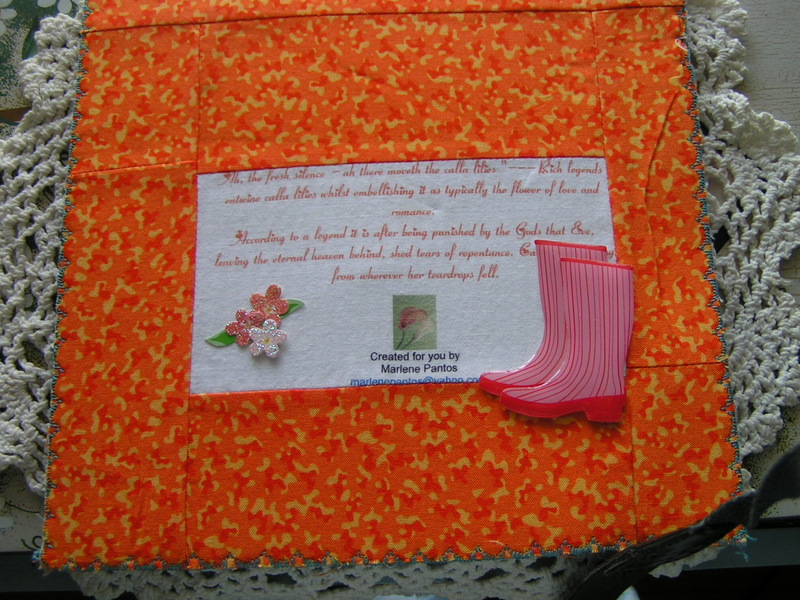 Here is the back of her card. Here is what the back says. Ah, the fresh silence, ah there moveth the calla lilies.. Rich legends entwine calla lilies whilst embellishing it as a typically the flower of love and romance. According to legend it is after being punished by the Gods that Eve, leaving the eternal heaven behind, shed tears of repentance. Calla Lilies sprang from wherever her teardrops fell. I believe I am going to have some of these growing in my yard next year. They are beautiful. 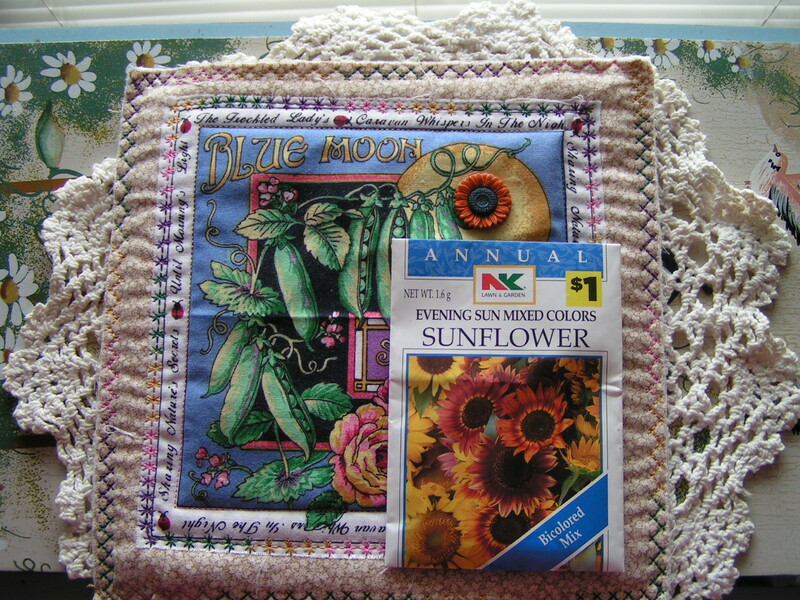 I wanted to do my page like a seed catalog page.. 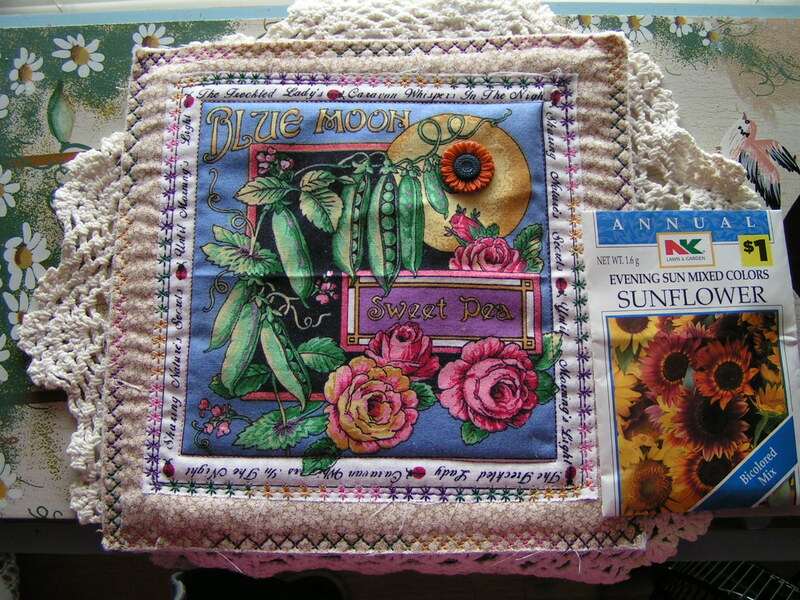 I made it and sent a package of sunflower seeds with my page. Here is one view and here is another. 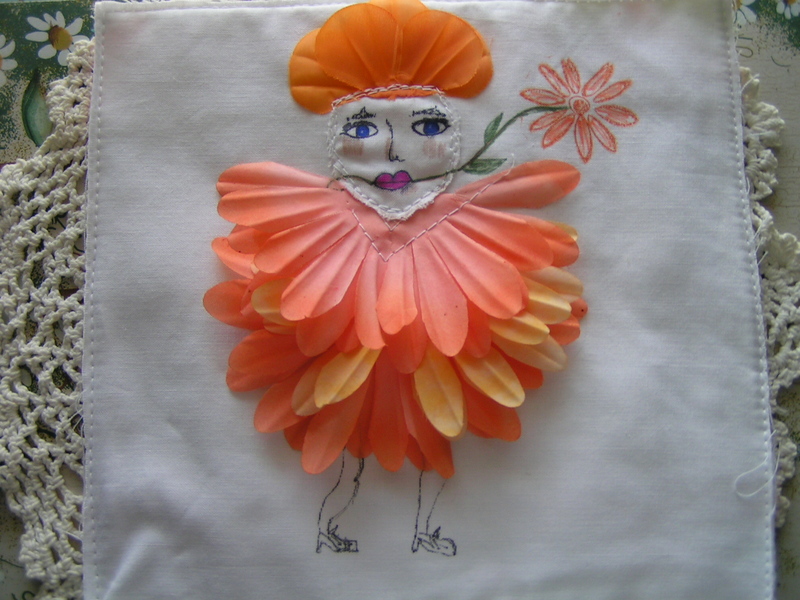 I hope you enjoy looking at these pages as much as we love making and getting them. Yes we will continue to have Fatbook Swaps as long as the members want to participate.